- A large footstone is located nearby engraved "A. D."
- This is a fenced area approximately 10' x 10'. The fence is in very poor condition. - Within the fence is a mound and a piece of stone which appears to be a marker. - This stone is broken in half. - There is a hand engrave on the stone that points skyward. - There is a footstone engraved "C.W." - This stone is broken and propped next to what appears to be the base. - The stone is not legible but there appears to be an dove engraved at the top. - The stone is broken in half with the bottom in the base. - There is a footstone engraved "E.J.L." Wm. B. & Margaret D.
- There is a footstone engraved "O.S.J." - The top of the stone is engraved with a dove with a branch in its mouth. 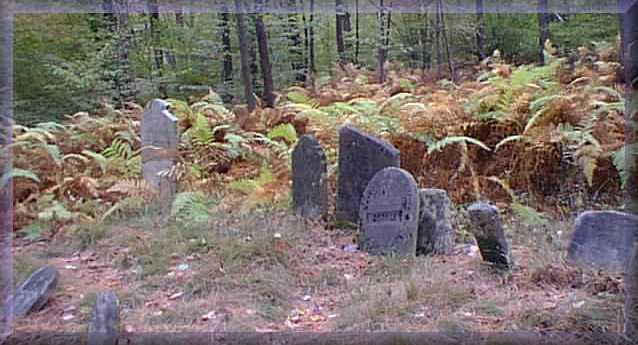 - There is a footstone adjacent with no apparent inscription. An obvious mound with no apparent marker. - A fieldstone at the head of a mound with no inscription. The Devitt family plot with a 5'+/- high marker surrounded by a very ornate iron fence. - There is a footstone inscribed "Father". - The stone appears to be in excellent condition. The fence is beginning to deteriorate, however the detail is still impressive. - Only the top remains of the stone and it rests on what is probably the original base. - There is no legible inscription except for the apparent cross engraved in the top. - The stone is in excellent condition and is firmly on its base. - The stone is in excellent condition but is very loose in its base. Footstone marked "C. _ M."
2 other footmarkers are located within the fence. - The fence for this area is in very poor condition. There is no stone at this site, however, there is an apparent mound. There are no stones here, however, there are 3 obvious mounds. - The stone is in good condition but is leaning out of plumb. There is a footstone adjacent to the headstone inscribed "M.A.B." - There is a well defined cross engraved at the top of the stone and the stone is in good condition. - The stone is in excellent condition and rests firmly upon its base. - The stone is in good condition and rests on its base, however, it is propped up by a stick. The stone is in good condition and has a cross engraved at the top. It is upright next to its base. - The stones are erect but weathered. The fence is in fairly good condition and the gate still works. The main stone can not be read and is broken. There is a footstone adjacent that is leaning against a tree that is inscribed "A.M.M." Condition of the stone: - The stone is in good condition and rests on its base. This is a marble stone resting on its base. The stone is not legible. This is the base to a missing stone. This stone is broken in 3 pieces and is severly weathered and not legible. This site has 3 distinct mounds with only one marker nearby that is inscribed "E.S." - The stone is broken in two pieces but still legible. There is a hand engraved at the top that points skyward. - The stone is upright and in fairly good condition. There appears to be a lamb engraved at the top of the stone. - The stone is in good condition and rests firmly upon its base. There is a cross engraved at the top of the stone. - The stone is very waethered and there appears to be a lamb engraved at the top. There is a mound located 5' to the east. This is the site of 4 unmarked mounds. From the location of the flag, there is a mound to the east, a mound to the west, and a mound north of the western mound. This is the site of an unmarked mound. - The stone is weathered but rest in its base. There is a cross engraved at the top. 6 years and 7 mos. - The stone is severely weathered and nearly broken. There is a cross engraved at the top. - This stone is apparently a replacement stone. It is made of granite and is in excellent condition. This stone is unlike any other in the cemetery. This is a base with a missing stone. - The stone is in excellent condition but it is no longer on its base which is nearby.